In the past we've looked at some interesting 360 mods. There was the controller LED mod that happened before the console was launched. There was the awesome laptop conversion of the 360 as well as a Half Life 2 mod. 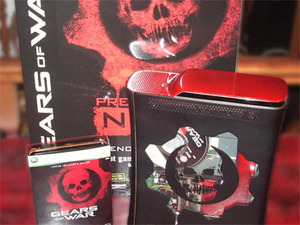 With the massively successful launch of Gears of War comes another really tasty case mod. The 'Xbox of War' made by a guy (I assume it's a guy I may be wrong) called Grim_d is located over on the Xbox Scene forums. 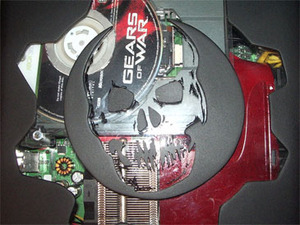 It sports a clear panel with the trademark Gears of War skull stencilled onto it. It's a sinister black and red colour which fits perfectly with the feel of the game. After checking out the pictures below you can also take a trip to the original forum thread. In other Xbox related news Pro-G is reporting that the first gamerscore over 100,000 points has been achieved on Xbox Live. Well done to StripClubDj, you officially have no life. Like this case mod? The discuss it in our forum or check out our own modding project logs forum. Earlier in the week, we had the chance to chat with well known game designer CliffyB at a Gears of War PC event. In this interview he talks about the game, his thoughts on game design and his wish to make a game based on Dance, Dance, Revolution but "with a pole”. Has the seminal duck and cover shooter been granted safe passage to the PC? Probably. Bit-tech takes a first look at a game that could possibly give Crysis and Bioshock a run for their money.